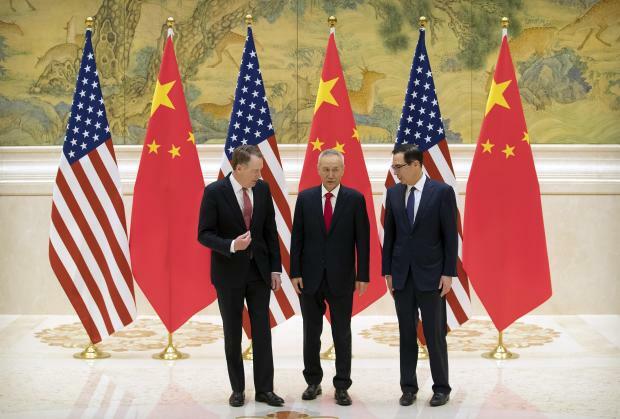 US Trade Representative Robert Lighthizer, Chinese Vice Premier and lead trade negotiator Liu He and US Treasury Secretary Steven Mnuchin talk before the opening session of trade negotiations. US and Chinese negotiators on Thursday kicked off two days of high-level talks that President Donald Trump says could decide whether he escalates the bruising tariff battle between the world's two biggest economies. Trump indicated this week he was open to extending a trade truce beyond March 1 depending on progress in Beijing. In December, he postponed plans to sharply hike tariffs on $200 billion of Chinese imports to allow more time for negotiation. We are "looking forward to discussions today," Mnuchin said as he left his hotel Thursday morning for the talks. Data released Thursday in China showed its trade surplus with the US - a major source of anger within the Trump administration - narrowed in January to $27.3 billion, even as its American imports plunged 41 per cent for the month from a year earlier. China's total imports also sank for the month, pointing to weak demand amid slowing economic growth. Trump also has said he expects to meet with Xi "at some point" to clinch a trade deal. "Markets will continue to watch – and react – closely to the ups and downs of the negotiations," said Trey McArver of Trivium Research. "But Sino-US relations are all about the two leaders, and it will ultimately be up to Xi and Trump to come to a deal – or not," he wrote Wednesday in a newsletter.